If you are all about empowering yourself while lifting others, escape with 109 World and Ambre van de Berg to Marrakech this May 23-28, 2019! This journey will allow us to explore the beautiful culture of Morocco, practice yoga and meditation all while supporting important local educational & empowering programs for women & teenage girls in Marrakech. Why women and teenage girls? Because in Morocco they are often ostracized from society and have little opportunity in life if they are from disadvantaged backgrounds (widows, divorcees, single mothers, orphans, women with little education, etc.). Our goal on this trip is to learn more and support two incredible organizations providing opportunities for them: Project Soar and Henna Café. We will be going to the incredible city of Marrakech, also known as the “Red City” – the fourth largest city in Morocco. Marrakech is a city of tremendous contrasts. It is lively and colourful in the Medina between all the souks, idyllically tranquil in the Jardin Majorelle, the Paradise Valley and the view from the top of the Atlas mountains is simply majestic. The city is around 50 kilometres away from the mountains, and a good 150 kilometres from the Atlantic. 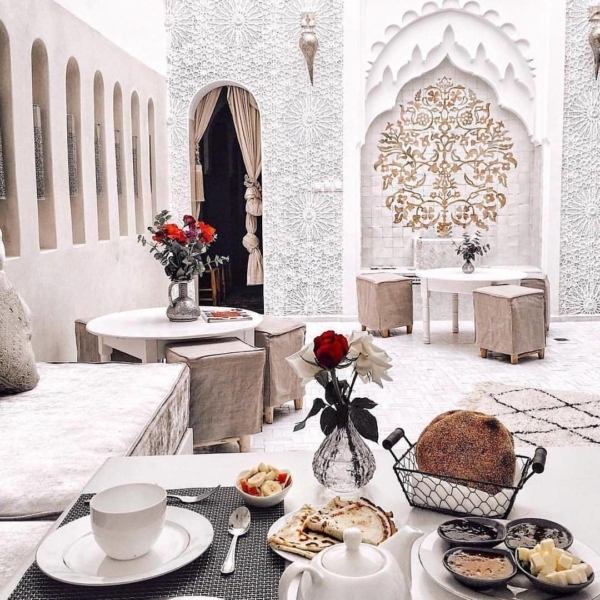 Full of gardens, palaces, mosques, traditional Moroccan Spas (hammam) and the beautiful Medina (old town), this city is full of culture, history, adventure and relaxation. Marrakech leaves everyone that visits with the feeling that they need to return one day, for sure! 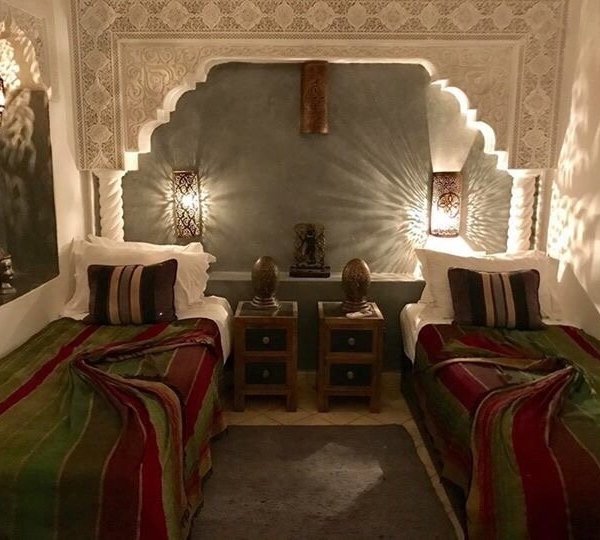 We will be staying at the beautiful Riad Star. 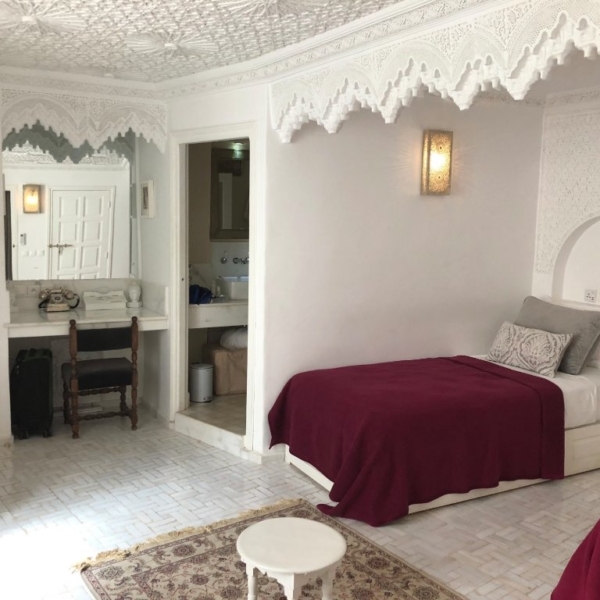 This stunning Riad was formerly home of Jazz Age superstar Josephine Baker and has been remodeled with a variety of exquisite rooms, each with its own design and charm. 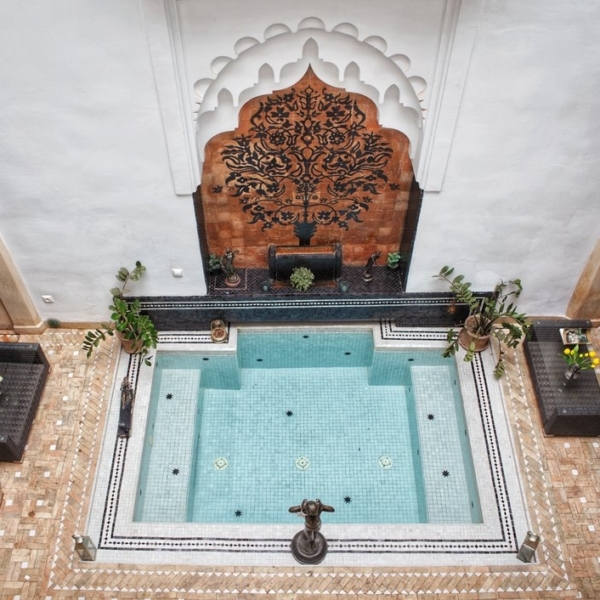 This Riad is renowned for its excellent service and prime location in the heart of the Medina. 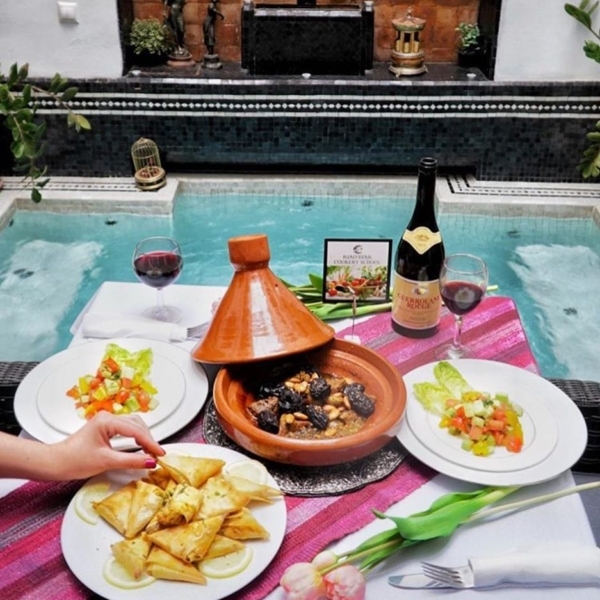 Equipped with a beautiful rooftop terrace where we will practice yoga, a traditional Moroccan spa (Hammam), and dipping pool located at the center of the courtyard – we will be in pure bliss throughout our stay. We can’t wait to call this little paradise home for the week! 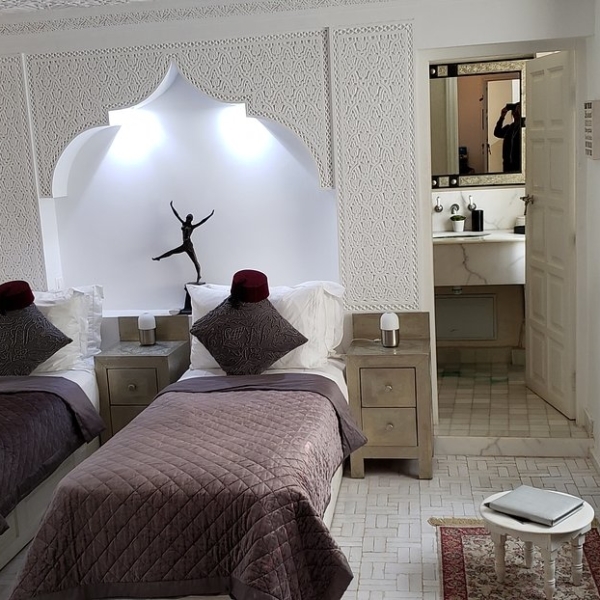 Each of Riad Star rooms has its own personality, all have everything you need to enjoy your stay in Marrakech including air conditioning, en suite facilities, mini fridge, room safe, hairdryer, flat screen TV, luxurious pure silk duvets and complimentary toiletries. You can check the details of all rooms here. For this retreat we will accommodate two twin beds in each room and all participants will have one roommate. Please email us at [email protected] if you have any special request regarding accommodation or any question. ✓ Optional excursions will be available at an additional cost including local markets tours, relaxing during a Hammam treatment, adventures in the Agafy desert, and more! We will be practicing our daily yoga and meditation at the beautiful Riad Star. This stunning Riad is equipped with a beautiful rooftop terrace where we plan on practicing our daily morning yoga and sunset meditation. In open air and with the magical view of the Medina, a lot of magic will happen on this private terrace. If the mornings are too hot, we have the amazing option of practicing our daily morning yoga around the dipping pool located at the center of the courtyard of Riad Star. This retreat is not possible without the hard work and brilliance of this wonderful team. A trip to India opened my eyes. In 2011, I traveled to Mumbai and Goa in search of adventure. What I received was a clear arrow pointing toward my life path: to dedicate my life to raising awareness of a healthy body and a healthy world, and inspiring people to reconnect to, heal, and strengthen both. My goal is simple: To make this planet a greener and a more beloved place for everyone, and to smile along the journey. Yoga is a powerful tool and the one I call on every day to fuel my mission. Because when you feel whole on the inside, you can be of service on the outside. If you had a tagline for your life, what would it be? Mine is: Always in motion, just like the ocean. I travel the world for a living and for growth. I love empowering people through organizing inspirational workshops and festivals, and I assist in trainings for self-development that I can pass on to my students. I also rarely sit still since running, jumping and dancing are way more fun. My journey brought me to a Caribbean island as a program manager and event coordinator for Island Yoga Aruba, as well as an active volunteer for the non-profit global initiative, 109 World. Both companies use the influence of social media and social mission trips to empower everyone everywhere to stand up as a humanitarian in their own way, and I’m so happy to be a part of it. As the Executive Director for 109 World, Leticia is on a mission of helping individuals fulfill the promise of their potential through mindfulness and giving back. Leticia works incredibly hard for the day to day operations of the organization to run smoothly, as well as pursues the big picture vision for 109. She is an incredible leader and has such a kind heart - a combination that truly makes 109 as special as it is. Her role for this retreat will be as a liaison between the 109 group and our local partners. She will also provide support to Ambre where she needs in facilitating the mindful activities throughout our week and keep the day moving seamlessly and timely. 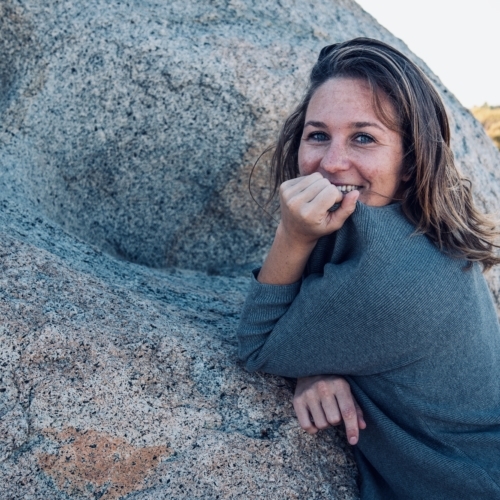 Savannah is the Associate Director for 109 and has a passion for impact and finding sustainable and long-lasting solutions to the world’s toughest problems. She works largely with coordinating logistics for 109 and being the main point of contact for trip participants in answering their questions and providing all information they need prior, during, and after each 109 retreat. Her role for this retreat will be coordinating with the 109 group on the flow of activities and answering any all questions they have. She will also provide support to Ambre as needed in guiding each of the activities and be an available resource for anything anyone may need. Linus captures beautiful things both on photos and in video. He is part of the incredible Soda/Lime team where he does that for a living. 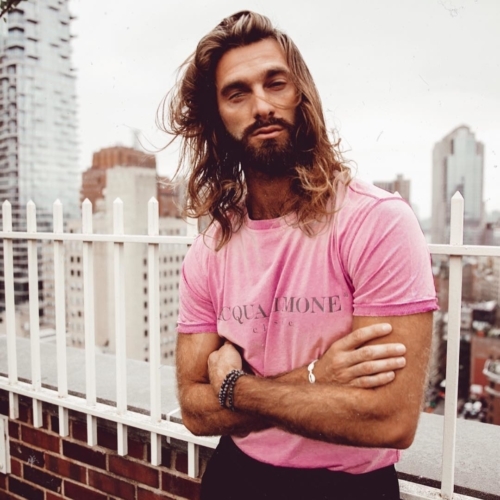 At 109 he works as our Creative Content Director to communicate the beauty and the challenges in all places 109 is active - creating inspiring content that allows participants to revisit the magic they experienced and allows us to showcase each retreat to our community. His role during this retreat will be to film and photograph as is appropriate and in line with participants preferences and 109's guidelines. He will be active during the more interactive sessions and leave the more personal, intimate moments to be felt solely by the group. 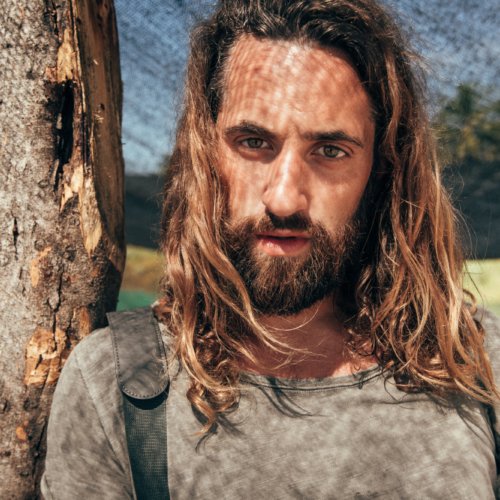 Tomas is one of the creatives that spread the vibes from 109's trips through visual imagery. In writing he is a man of few words, in real life… not so much. His head is full of ideas, words, love and laughter that he will gladly share with anyone around. His role during this retreat will be to photograph as is appropriate and in line with participants preferences and 109's guidelines. He will be active during the more interactive sessions and leave the more personal, intimate moments to be felt solely by the group. For this retreat we will accommodate two twin beds in each room and all participants will have one roommate. Please email us at [email protected] if you have any special request regarding accommodation. For the EARLY BIRD tickets, we also collect the US$500 deposit to reserve your spot. This deposit is non-refundable or transferable. Participants can be refunded (minus the deposit). Full amount payment for early birds is due January 1st, 2019. Full payment for regular price ticket is due February 23rd, 2019. After February 23rd tickets must be purchased in full. Please email us at [email protected] if you have any questions at all or if you would like to receive the schedule for this retreat. We would love to hear from you! I came into this experience with unfathomable trauma, anxiety, depression and truly a loss of myself; yet, I left having redefined my self-love and self-care, strengthened my voice, and grown in love for another community and people. Through this week and all the experience beyond, I am learning that I truly am my own healer, hero and leader. Thank you for keeping my heart soft and until we meet again, may 109 continue to change the world with its presence, action and intention. I can't put into words how impactful this trip was. I joined a group filled with some of the most inspiring and genuine people I've ever met. At the camp, we learned, we played, we laughed; the children are resilient, inspiring, and anxious to learn. I finally found a type of yoga and a teacher that I truly connect with, and I learned to listen to my own rhythm — both on and off the mat. Most importantly, I feel empowered to learn more, do more, be more, and give more. I’m not even sure how to describe my experience with these incredible, inspiring, organized, and thoughtful women! 109 World provided me an opportunity to serve a community I would not have been able to reach on my own. They obviously care deeply for their work and were in the trenches with all the volunteers to make this experience fulfilling and life changing. I would recommend a retreat with this group to every human being!!! I was looking for several months for a trip that would help rejuvenate my mind/body/heart and help me stay on a purposeful and happy path in life. When I saw this trip I knew it was exactly what I needed, and 109 did not disappoint! The group of women were all genuine, supportive, and so fun. The personal growth from practicing yoga, learning Muay Thai, and raw conversation was exactly what I needed to experience on the beautiful island of Samui. Pangea Organics, Bamboo Brush Society, Printology and NxTSTOP Apparel have made it possible for us to welcome all our participants for this experience with a special gift.